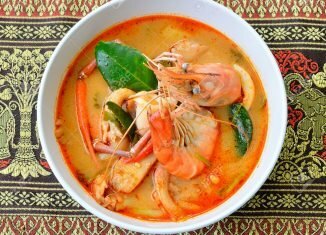 Thailand is a beautiful country with flavorful, aromatic food that truly complements the experience. 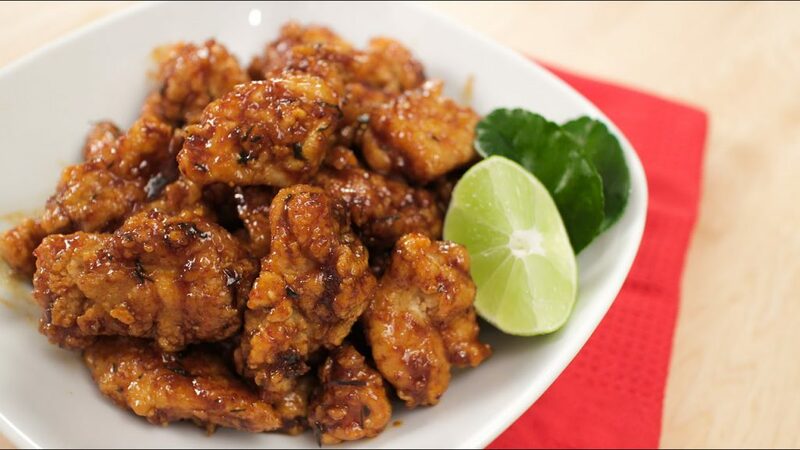 It’s bold, yet inviting, with a harmonious composure of spicy, sweet, and sour flavors that dance upon the palate. In Thailand, proper Thai cuisine isn’t merely a melody of these tastes. It also ranges in textures within each dish as well as from plate to plate. When tasting Thai cuisine, you’re likely to find many new favorite dishes. Spicy yet comforting soups, fruity and tangy salads, soul satisfying curries, and even sweet desserts, there is plenty to love about the food you’ll find in Thailand. Here are 50 of the most heavenly tastes of Thailand that you absolutely must try! 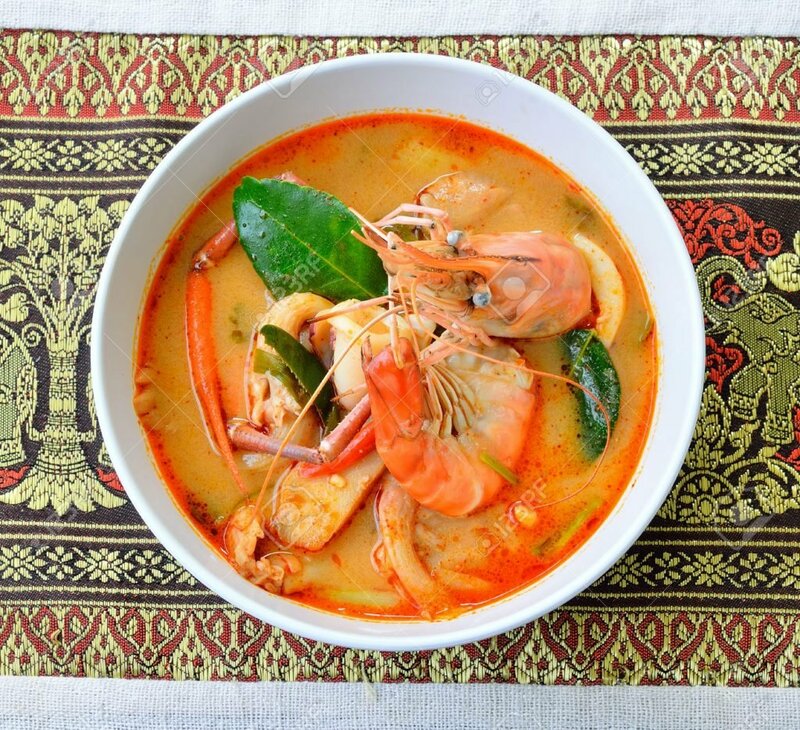 Perhaps one of the most quintessential flavors of the entire country, Tom Yum Goong is a soup with a slightly spicy charm fired up from fresh chilies. The complex flavors of lemongrass, kaffir lime leaves, galangal (a rhizome that is similar and often confused with ginger), and a variety of Thai herbs are boiled up to create a warm, soothing broth. Mushrooms and tomatoes add a bit more earthiness, though the star of course is the shrimp which retains the essence of all these ingredients for a truly heavenly experience. Tom Khai Gai is a soup that eats more like a curry. It’s a bit heartier and creamier thanks to the coconut milk broth. It’s very rich, yet perfectly soothing. 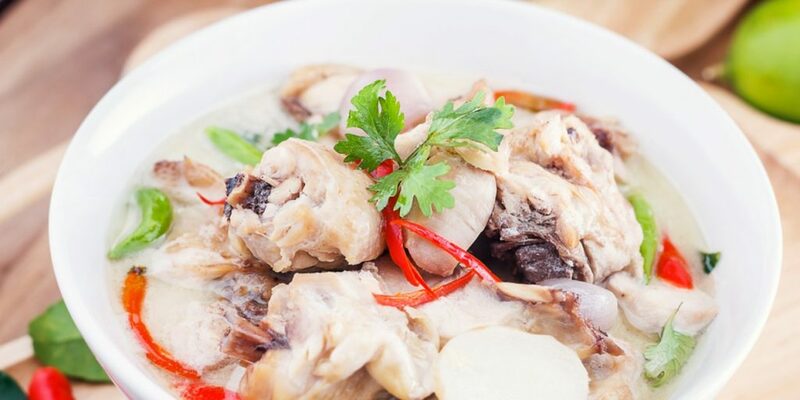 You’ll find this soup bursting with several different types of mushrooms, boneless pieces of chicken, lemongrass, and kaffir lime leaves. A little cilantro and galangal add that extra something that ties all the ingredients together into something you’ll crave forevermore. While you can most certainly find Thai green curry dishes made with pork or even beef, having it with chicken is one of the most common and delicious ways to enjoy this comforting curry. The rich coconut milk base mixed with chilies give it that sweet, creamy, and spicy flavor that Thai cuisine is so well-known for. 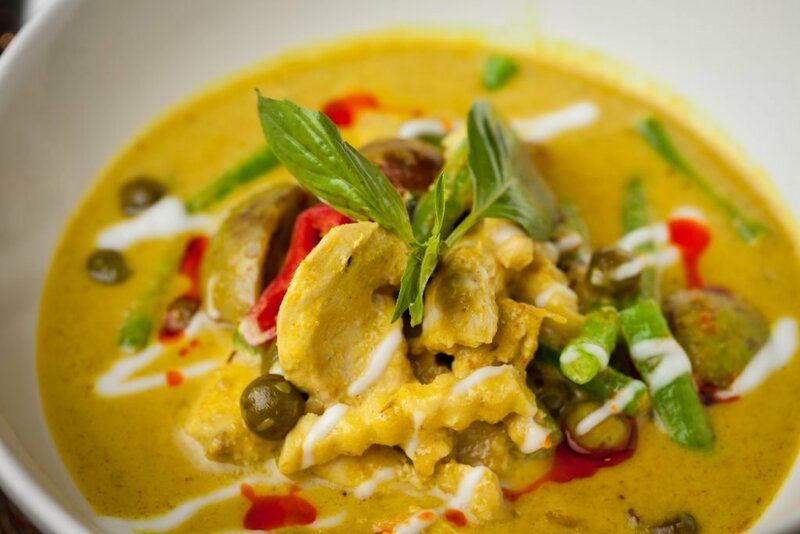 In fact, Thai green curry is one of the most popular of all Thai dishes around the world. Mixed with hearty hunks of chicken and Thai eggplant, it’s an absolute delight. The curry is perfect to soak up with lots of rice. This dish hails from the northern part of Thailand and is probably one of the most notable from the area. With a base of chili paste created with chilies, garlic, shrimp paste, and shallots, the sauce in this dish is so complex and savory, it’s hard not to crave. Typically, pork is the meat used in the creation of this dish. 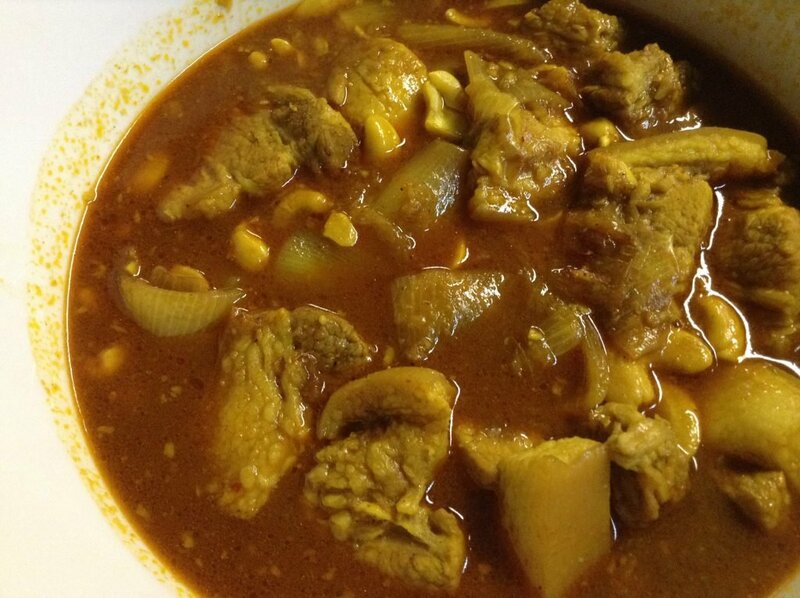 It gets simmered for a long time in the savory curry paste so that it falls apart from tenderness. You’ll often see this dish adorned with roasted peanuts and sometimes pickled garlic too, which adds another dimension of flavor and texture to this wonderful dish. Because Thailand has a warmer, tropical climate, you’ll notice the pattern of coconut milk throughout many of the dishes here. The uplifting scents and flavors of coconut are known to elevate your mood and provide plenty of healthful benefits. Hor Mok Ma Prow Awn is a slightly sweet curry made with an assortment of fresh seafood (which will vary on the variety). It’s cooked in that rich, delicious coconut milk cream along with fleshy bits of coconut. Once it’s ready, it’s served in a young coconut, making for a spectacular presentation. 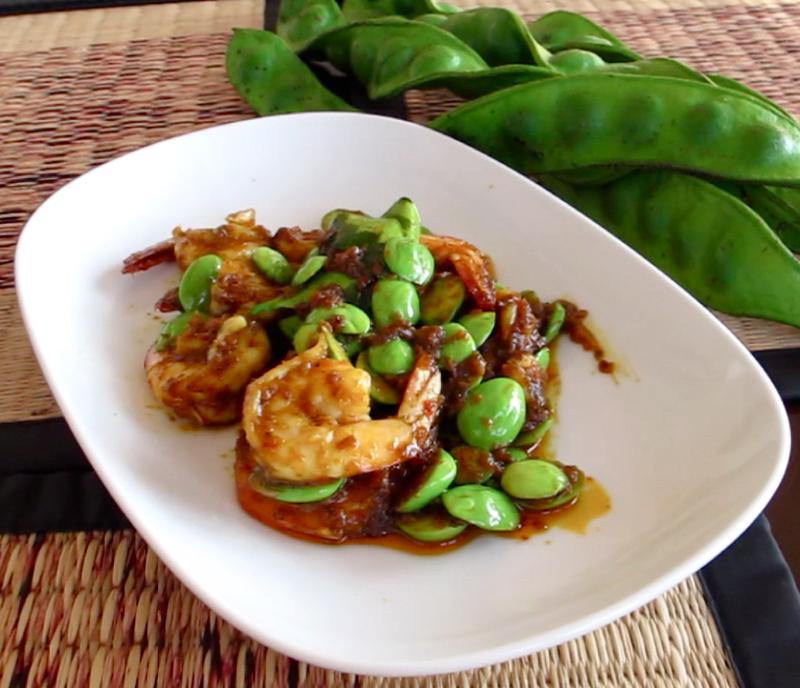 This dish is spectacular and for seafood lovers, it’s something you simply must try! 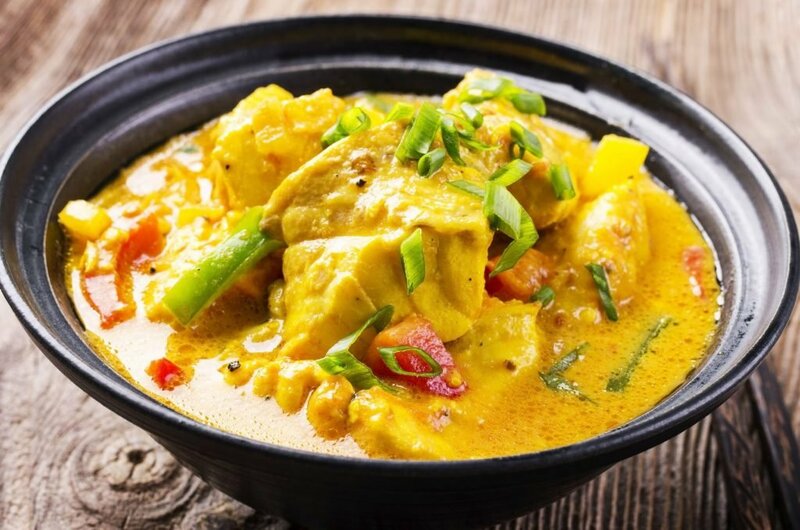 If you want to give curry a try but worry about the level of spiciness, Panang Curry is a great way to make that happen. With a reddish-brown color, it has a light, sweet flavor with just a hint of spice. The coconut milk balances it out to give it that sweet coconut taste. You can enjoy it made with pork, chicken or even beef, though the curry sauce is always the star. It’s thicker than Thai green curry which tends to be more soup-like. 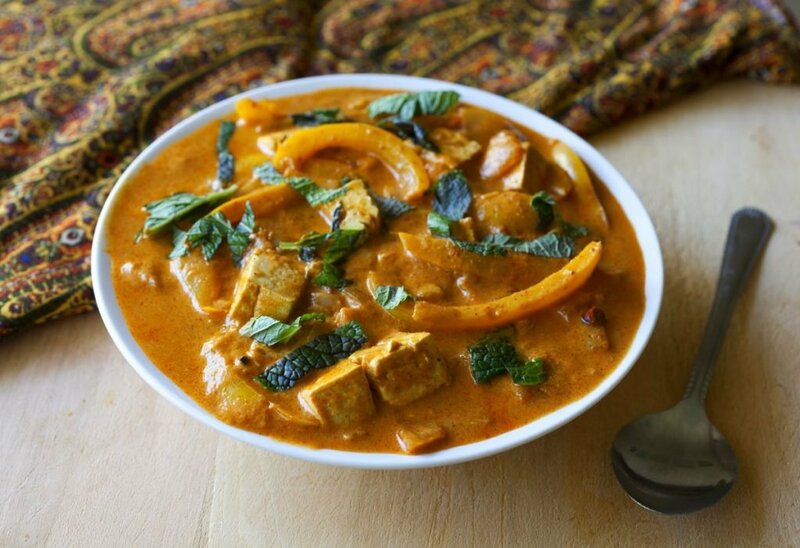 Panang Curry has some textural heft to it, making it an outstanding companion for rice. It’s usually topped with fresh slices of kaffir lime leaves, a zesty component that ties the whole thing together. You’ll also see it topped with chopped peanuts that give it just the right bit of crunch. Don’t let the name scare you away. With a name like Stink Beans, it’s easy to see why this dish hasn’t really caught on in the states. But give it a try because this southern-style Thai dish is full of flavor packed into a wholly satisfying texture. Stink beans grow just like peas in a pod. You’ll often find Pad Sataw made with shrimp or pork, in a savory sauce made from Thai curry paste, shrimp paste, oyster sauce, and kaffir lime leaves with just a little bit of sugar to bring it all together. What’s remarkable about this curry dish is that it’s a Muslim and Thai mash-up that came to be thanks to heavy influences from old Persia. Arabic flavors mingling along with Thailand’s coconut milk are a match made in heaven. 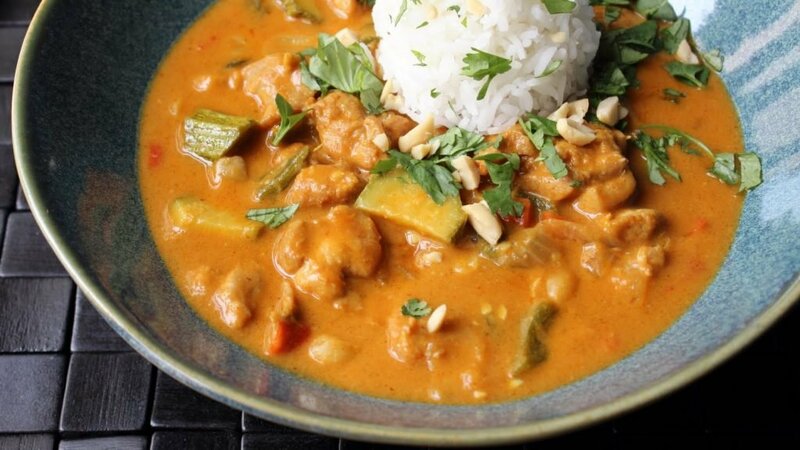 Ever since, this Chicken Peanut Curry dish is something everyone can agree is spectacular. The sauce is formulated with curry paste, minced ginger, tamarind paste, peanut butter, coconut milk, and kaffir lime juice makes for a blissful bath for the chunks of potatoes and chicken. And like all Thai curries, Massaman Gai is divine with plenty of rice. 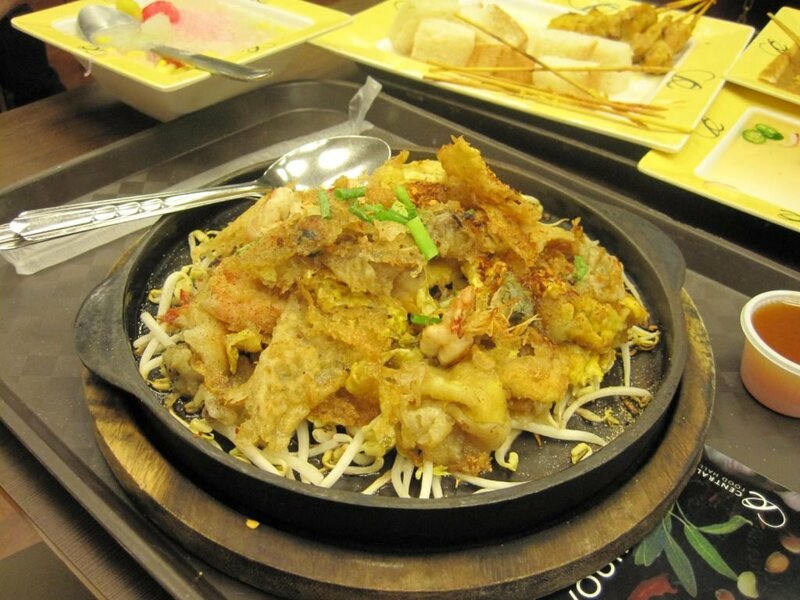 It seems that every Asian country has its own version of a hot pot dish and Thailand is no exception. This is the kind of meal you sit back, relax and eat. There is no rush with this. In fact, it’s best enjoyed with plenty of friends and plenty of beer. So what is it? It’s a clay pot filled with a gentle broth. 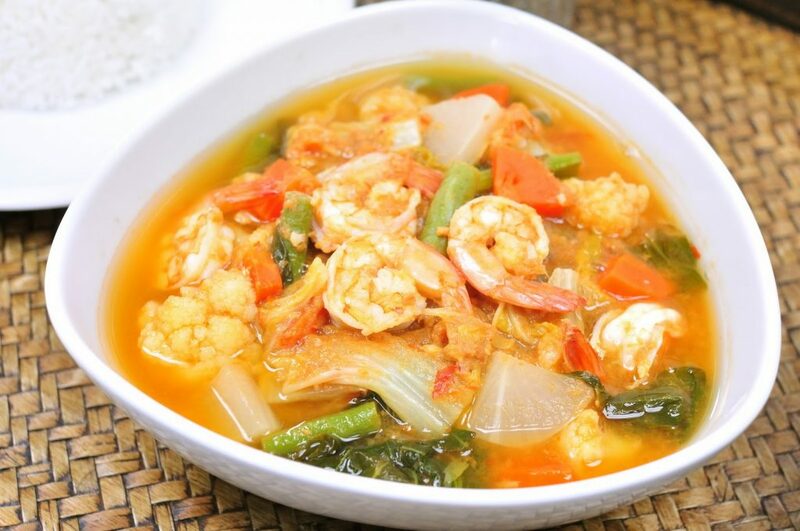 It’s a flavorful yet low fat and very healthy dish that you’ll enjoy savoring. You can cook up a variety of vegetables. Plus, eggs, pork, and mung bean noodles are another great way to add more to your dish. You can find these along the streets, and while there are restaurants for Jim Jum, they tend to get rather hot with no air conditioning so enjoy it outside. If you want to eat your fill and enjoy one of the best and cheapest eating adventures in Thailand, you’ve got to go for Moogata, which is Thai Barbecue. Again like the Soup Hot Pot, every Asian country has their own version of barbecue. In Thailand, it’s a lot like Korean-style barbecue in that you sit in packed restaurants that have individual grills on each table. It makes for a fun and interesting way to enjoy lots of grilled meats. While the quality is usually not up to par, if you’re looking for quantity, Moogata is going to be your Thai soul mate during your visit. In addition to the plethora of meats, you’ll also be able to cook up as many vegetables as you desire too so that you can effectively balance your meal of meats with a bit of green. Don’t forget the beer. Moogata is made for beer drinking! Omelets are often a brunch or hearty breakfast item in the Western world. But in Thailand, there are a variety of omelet-style dishes that will shatter your preconceived notion of what omelets should be. One of the most divine among these Thai omelet sensations is the Hoy Tod. It’s a gigantically-sized omelet stuffed full of oysters. It’s usually served atop bean sprouts and sprinkled with pepper and cilantro. A word to the wise: when it comes to omelets in Thailand, to truly enjoy them like a local, you’ll want to add just a tad of tomato sauce (known as sauce prik). It is like the glue that holds it all together. As mentioned, there are other varieties of omelets you’ll find in Thailand. One of them is like a fancy exploration of Hoy Tod. It’s called Aor Suan and you’ll find it at most of the sit-down restaurants that serve seafood. Cha Om Kai (Thai Acacia Omelet) is another uniquely Thai omelet. The acacia leaves add a special flavor and texture that are unlike anything you’ve ever sampled before. Kai Jeow Moo Saap (Thai Pork Omelet) is another simple omelet offering. It seems so basic but it is full of flavor, thanks to the pork. But beware – the omelets in Thailand are fried up in loads of oil making them not very healthy. Enjoy your Thai omelet over rice with sauce prik for true bliss! When you roam around the streets in Thailand taking in all the incredible sights of this vibrant country, you’ll likely find yourself feeling a bit hungry. All that walking works up an appetite, plus all the delightful smells wafting your way from the street vendors will definitely make your tummy rumble. When that feeling of hunger hits you, stop off for some Khao Neow Moo Ping. These skewers of grilled pork come in a plastic bag with sticky rice. 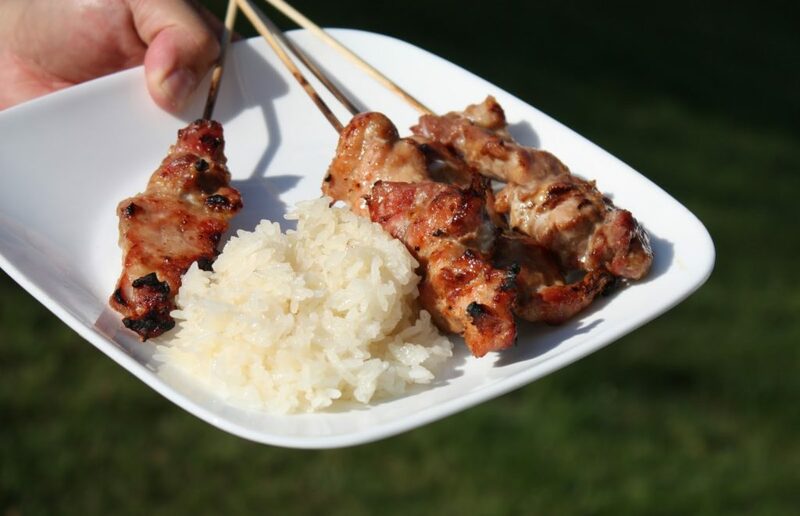 While they make a fantastic snack thanks to the perfect combination of slightly charred, grilled pork marinated in Thai seasonings along with the sticky rice, you can actually enjoy them any time of day. Many Thai people will eat them for breakfast, lunch, or dinner too. Once you try these, you’ll likely feel like you can never get enough! Every country the world over has a love affair with sausage. You’ll find it on every continent and the unique twists each country brings to their own sausages is definitely something to explore if you’re a sausage lover. In Thailand, you’ll find sausages made with minced pork, typically combined with distinctive Thai flavors like lemongrass and garlic. The best flavors of these come from Northern Thailand where they are called Sai Ooah. This is another fragrant Thai offering that you’ll be hard-pressed to walk past on the bustling streets. The sight of this glorious sausage coupled with the mouth-watering smell will halt you in your tracks. Try it and you won’t be sorry. It’s a sausage lover’s dream come true! If you’ve been to a Thai restaurant in America, you’ve likely seen “Satay” on the menu. Usually, you can find it with chicken or pork, served with a delicious peanut sauce for dipping on the side. In Thailand, you’ll usually find the satay in pork form. 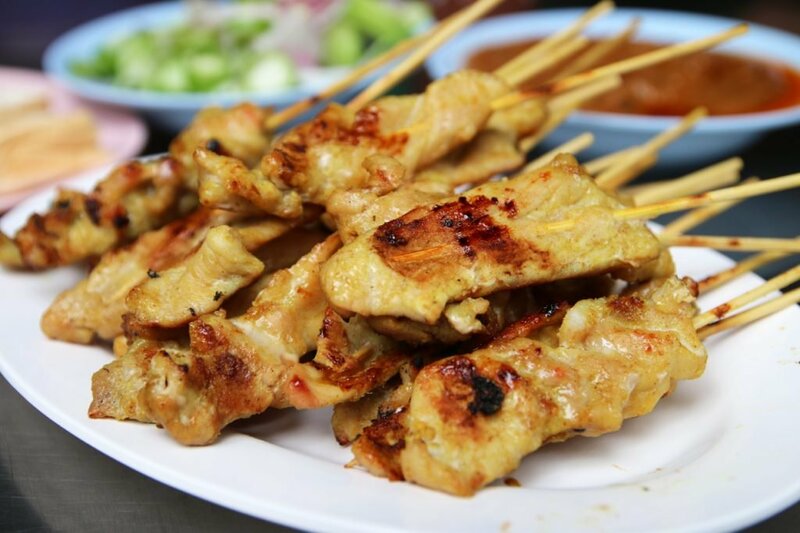 Chicken is still available but it’s more common to find pork satay. Meaty strips of pork get marinated in a mixture of coconut milk and turmeric. Then they’re grilled with even more coconut milk. You’ll find that wonderful peanut sauce in Thailand too, but you’ll also get pickled cucumbers and red onions to round out your meal. 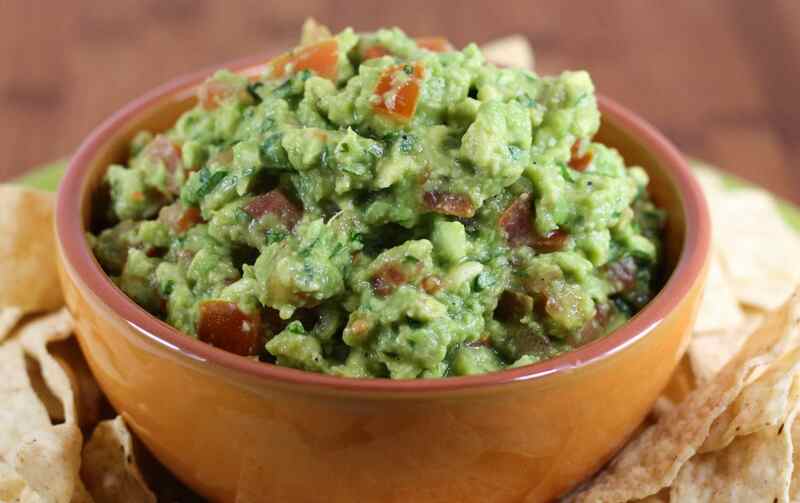 It makes for a fantastic snack or a perfect accompaniment to plenty of beer. Every country has an obsession with fried chicken. Asian countries are no different. In Korea, there are fried chicken places everywhere you look. The top restaurant chain in China is KFC because of their love of fried chicken. And of course, stop into Thailand and you’re going to see more fried chicken. But in Thailand, they give it that distinctly Thai twist that elevates the fried chicken eating experience to a whole new level. You’ll find plenty of street stalls as well as sit down restaurants with crispy fried chicken. What makes it so unique here is that it’s served with a slightly spicy sweet and sour dipping sauce. While you might be able to get fried chicken anywhere in the world, don’t pass it up in Thailand. 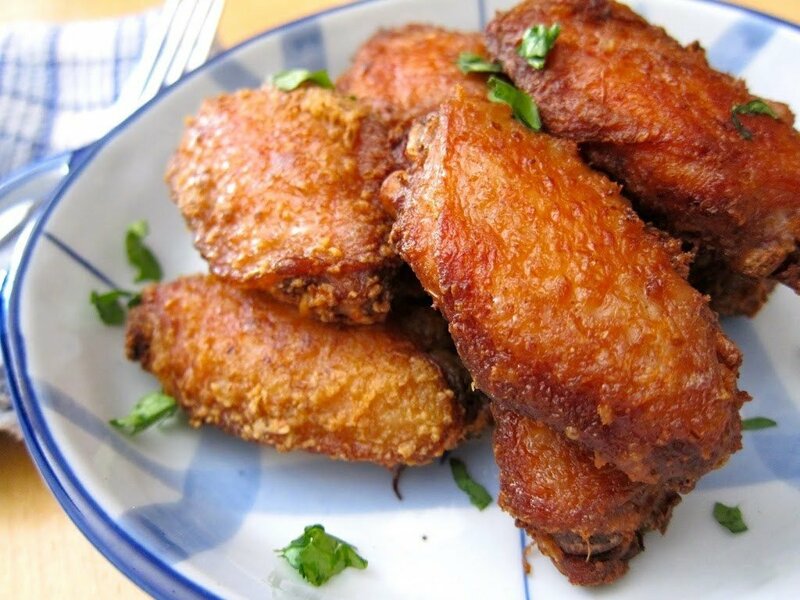 You’ll love the juicy, crispy texture and the melding of flavors. As with all of the Asian countries, fried rice is a popular dish in Thailand. And like other Asian countries, fried rice is typically crafted with whatever is around. It could be leftover shrimp or chunks or pork, but these little odds and ends make for a fabulous fried rice experience. 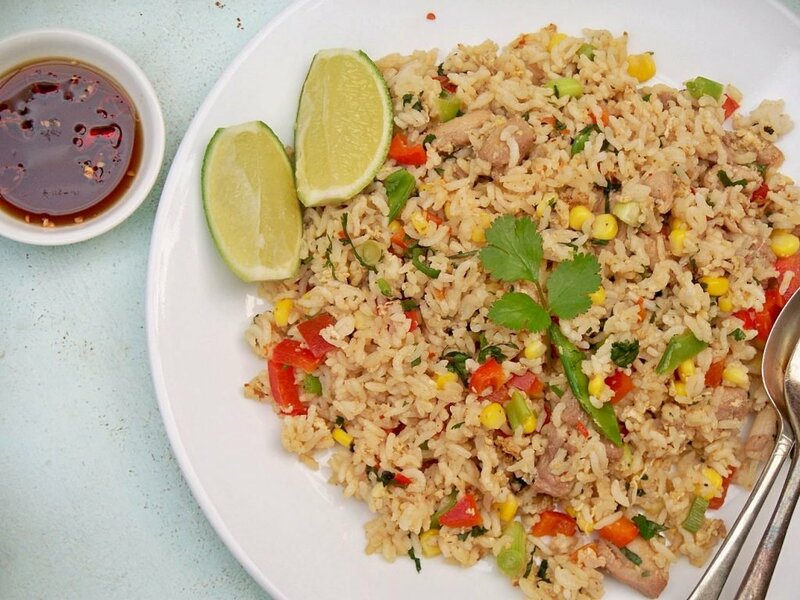 What sets Thai fried rice apart from fried rice in other Asian countries? It’s the addition of lime juice and Thai chilies that have been soaked in fish sauce. In Thailand, it’s one of the ultimate comfort dishes and something the locals turn to time and time again because it’s filled with chunks of things like pork or shrimp, eggs, and vegetables and the seasonings completely unite it to make this seemingly simple dish extraordinary. 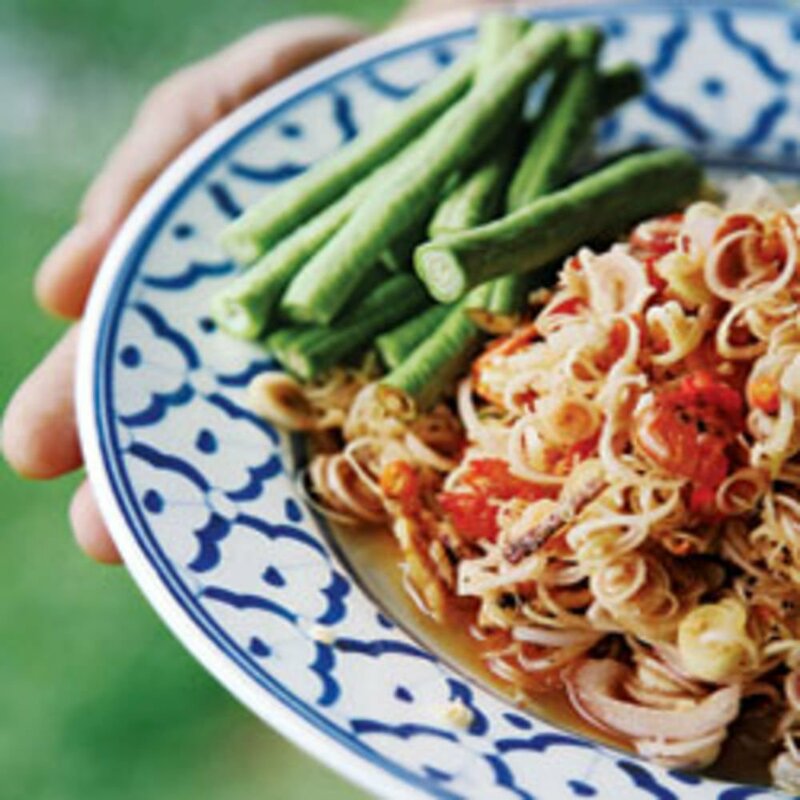 For a true taste of Thailand, you can’t leave without trying this staple Thai dish. It hails from the Isaan region, an area you really shouldn’t miss if you want a truly authentic Thai experience. 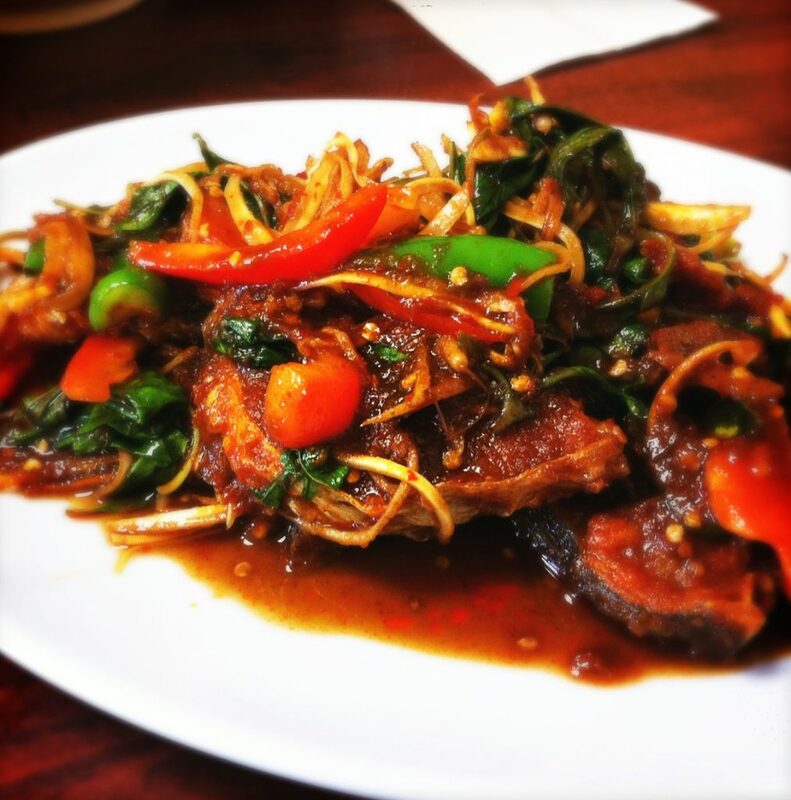 Nam Tok Moo is one of the most satisfying pork dishes of all time. It hits on every sense with every bite and will be something you just can’t get enough of. 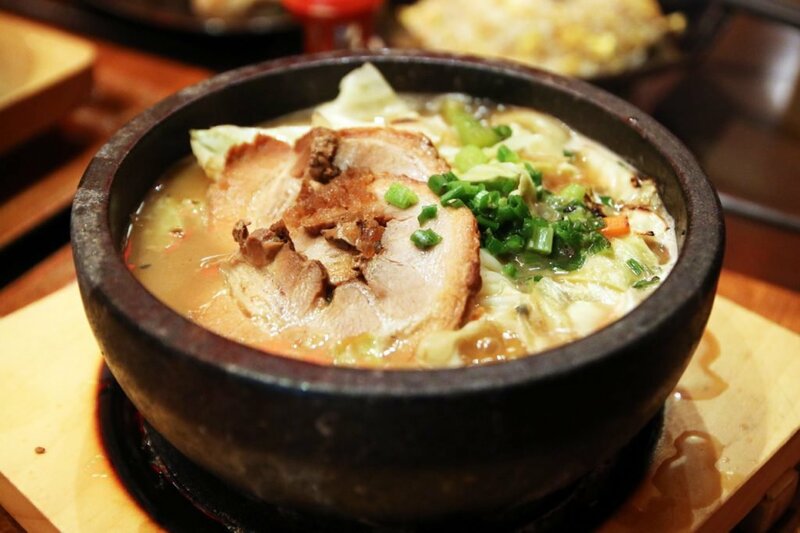 It consists of sliced grilled pork that is cooked up with crushed toasted rice. This gets mixed with onions and chilies. Then for the coup de gras, it’s slathered in fish sauce and lime juice. It’s absolute heaven! 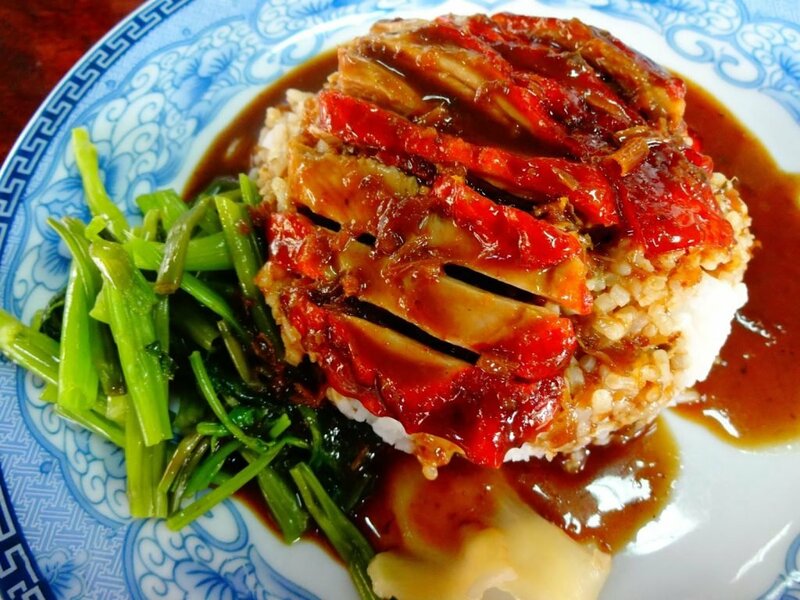 Duck is widely available and intensely popular in Thailand. You’ll find it typically served in two ways. The most common way is roasted. The skin takes on that delightful browned crispiness from the natural duck fat and delivers a sensational flavor. The second way you’ll find it draws largely from Chinese inspiration. In this method, it is boiled in a broth of soy sauce mixed with Chinese five spice. Ask anyone which is their favorite and you’ll soon have a very heated discussion. Both are fantastic in their own right and worth sampling. If you’re not sure where you can find duck, simply look for restaurants with duck hanging in the front windows. It’s easy to find, however be aware that when it comes to doing duck at the restaurants, each restaurant usually only specializes in cooking the duck in one of these two styles. So if you want a roasted duck, you’d better make sure the restaurant you choose roasts it instead of using the boiling method. 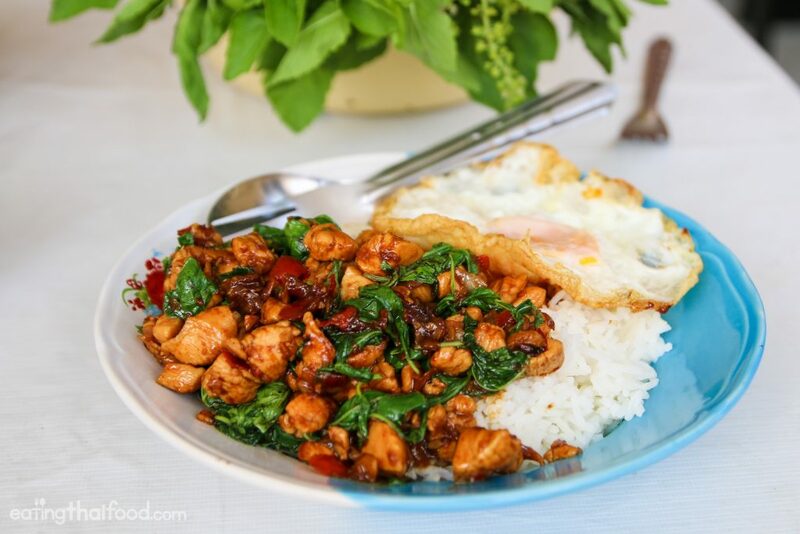 Pad Gra Pao Gai Kai Dao is one of Thailand’s most popular daily dishes. With one bite, you’ll see exactly why that is. As a matter of fact, if you come all the way to Thailand and want to get an absolutely authentic taste of this country, do not leave without ordering this dish at least once. It’s so good though that you will likely order it every day for the duration of your stay. This stir-fried Thai basil dish is great with any meat. You can order it with chicken, shrimp, pork, squid, or even tofu if you’d prefer. Order it the way the locals do by getting a fried egg on the side. Enjoy it just like the Thai do by sprinkling fish sauce with chilies on top. It’s this whimsical melding of flavors from that slightly charred basil, the salty meat and the egg with its smooth, running yolk that all come together in such a harmonious fashion that you will definitely be back for more. If you thought catfish was something that only the southern United States had in abundance, think again. Thai cuisine has a bunch of dishes that use catfish as the main ingredient. In fact, it’s one of Thailand’s favorite fishes to cook with. Looks can be deceiving with this dish. True that it looks as though the fish has died and gone off to swim in pool of grease, one bite and you’ll see it’s one of the most sensationally flavored Thai fish dishes ever. It is cut into pieces to ensure every inch of it gets fried up to absolute crispy perfection. Once it’s fried just right, it gets sautéed in a sweet chili sauce. From there, the catfish is garnished with kaffir lime leaves. While it is on the greasy side, make an exception and try this phenomenal dish. The crunchiness and the flavors make it one of the most craveable dishes anywhere. Thailand is an abundant source of seafood. Clams are some of the most beloved catches from the sea. One of the best ways to savor these treats from the sea is to enjoy them in the dish Hoy Lai Prik Pao. 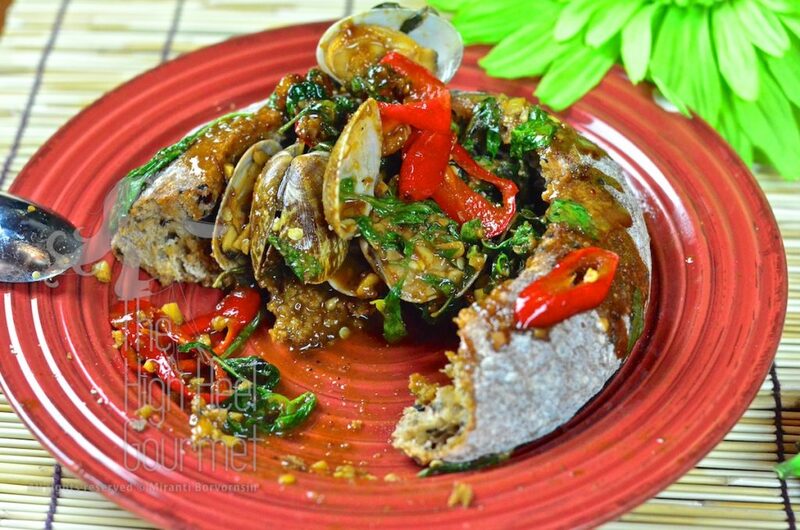 In this dish, clams are stir fried with lots of prik pao (a spicy Thai roasted chili and shallot paste). As the clams finish cooking, sweet basil is thrown on top. This combination of sweet and spicy makes for a sauce you will drink up with the empty clam shells. Purely divine, if you’re a fan of clams, you need to eat this dish. Another way to enjoy catfish in Thailand is to have it slow-smoked over hot charcoal. This dish that originally hails from the Isaan region is not the prettiest dish, but it ranks right up there with some of the tastiest. The smoky flavor from the charcoal grilling permeates every bit of the flesh of the fish. 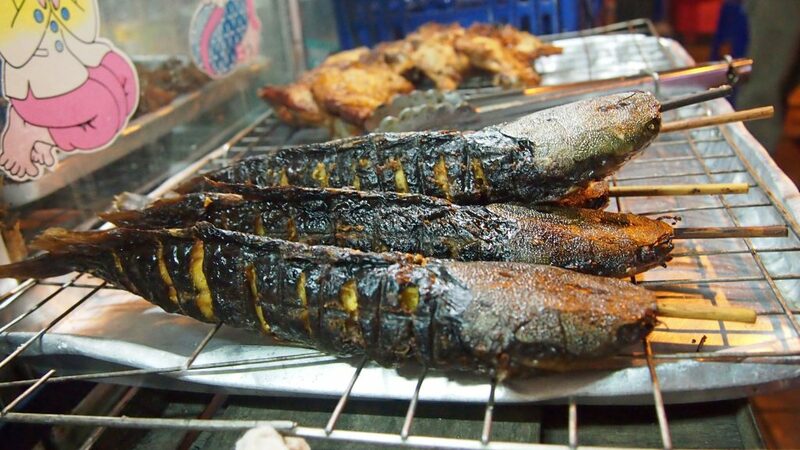 A moist, flaky delight, grilled catfish roasted over hot coals is only made more sublime with chili dipping sauce. It’s a fantastic yet very simple indulgence. In Thailand, the bounty of the sea is what comprises much of the cuisine. 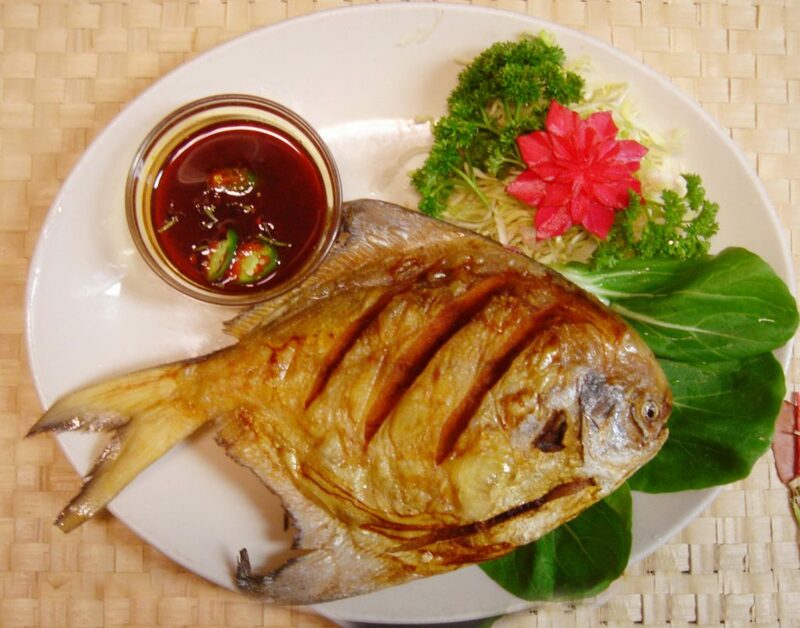 One of the dishes the Thai people hold very dearly is that of a fried fish that is drenched in the traditional Thai sweet chili sauce. Using the fresh catch of the day, this method of preparing fish is something you’ll fall in love with. The outside of the fish is crunchy and the sweet chili sauce turns into a glaze that satisfies both your urges for something sweet yet spicy. Between the crunchy texture outside, the soft and supple meat of the fish inside and the fiery yet sweet sauce, this is one of the most essential Thai dishes to try. If you like sea bass, the Asian variety of it (called barramundi) will soon be your new favorite. 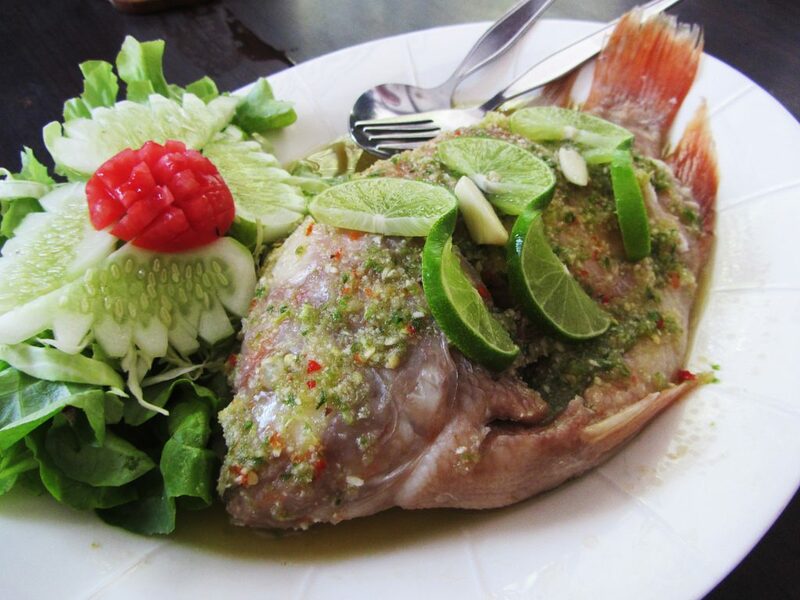 Pla Kaping Neung Manao involves the steaming of a whole sea bass in a tangy, sour lime sauce that pops with sliced chilies. It’s garnished with raw garlic for a healthful, flavorful plate. Steaming the fish in this sauce keeps it moist inside, allowing it to flake apart when you eat it. You’ll typically see it served in a fish-shaped metal dish. Underneath the dish, a warming candle is lit to help keep it at the optimum hot temperature as you feast. This citrusy sea bass dish is sure to please any seafood lover. Within Thailand, when you’re hankering for seafood, there is one fish that you’ve likely never seen before but should definitely give a try. The snakehead fish is very common to the people of Thailand, however to a foreigner, you’re likely to be taken aback by how ugly it is. It looks very unfriendly with its sharp protruding teeth and rather hideous visage, but in a dish like Pla Chon Lui Suan, you can easily forgive the formidable face of this fish and indulge in the zesty flavors. It’s steamed with a variety of vegetables, then topped with a sour yet garlicky sauce. The flavors are intense and utterly divine. It’s worth trying though try not to gaze upon the fish head and you’ll be fine. 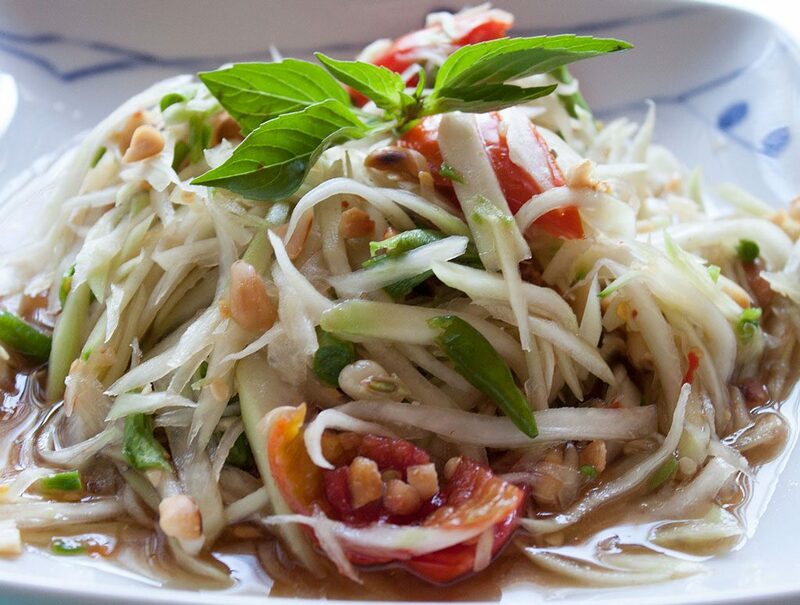 Just like most of the world knows of Thai curries, Thai Green Papaya Salad is a common offering in Thailand as well as Thai restaurants you’ll find in America. 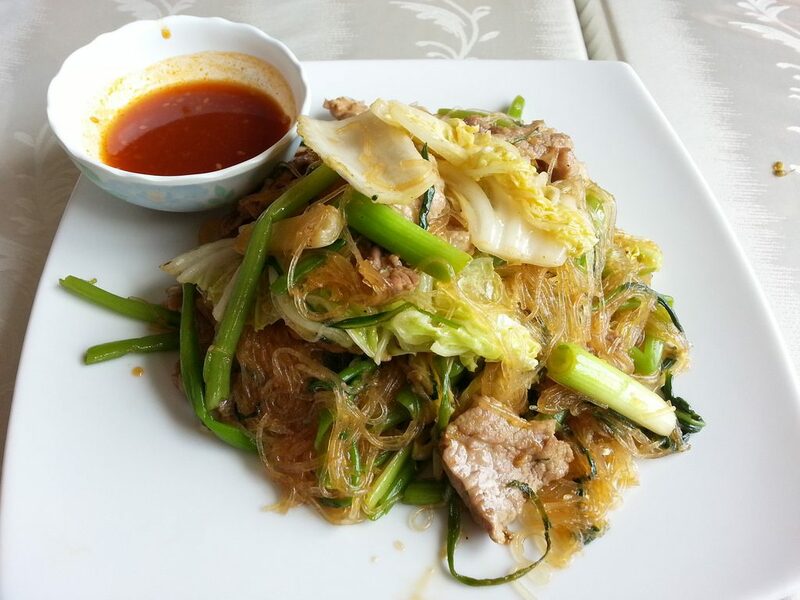 It’s made with green papaya that has been shredded and adorned with tomatoes and long beans. If that sounds ordinary, just wait. It also has a mix of dried shrimp, crushed toasted peanuts and a heaping pile of red chilies. What makes it really pop though is that all of these ingredients are taken and ground up with a wooden mortar and pestle. This truly allows the flavors to come together, while giving it a splendid texture. In Thailand, you’ll find this delightful salad in many different varieties. 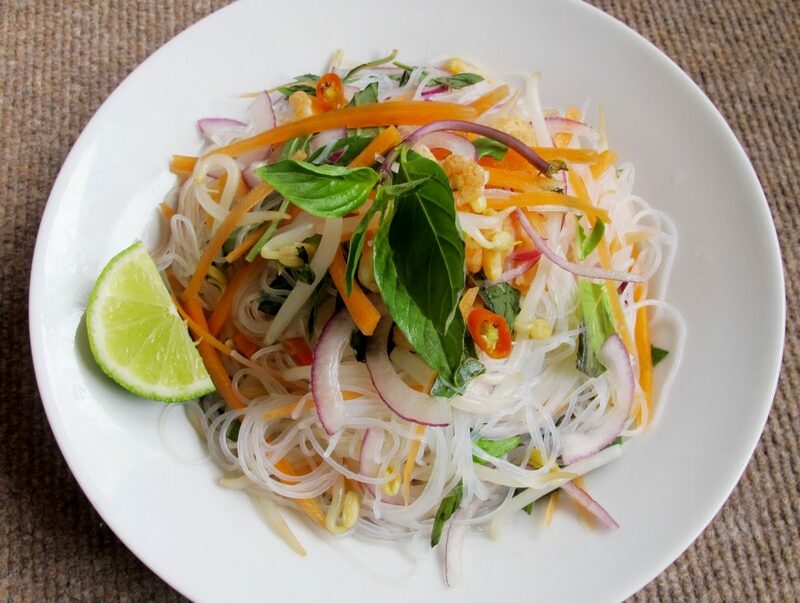 Som Tam Thai is a version that includes lime juice and fish sauce for the dressing. Som Tam Boo incorporates small crabs that have been fermented. Som Tam Pla Raa features fermented fish, and Som Tam Hoy Dong is embedded with fermented oysters. Most Thai dishes include the use of lemongrass. It’s what gives much of the dishes that signature flavor you associate with Thai cuisine. Lemongrass can be a bit rough and woody, so it is mostly boiled to extract the flavor, however when it’s sliced very thin, it can be incorporated into dishes. One of the dishes that best incorporates lemongrass is Yam Takrai Goong Sot. It’s a salad of boiled shrimp, toasted cashews, red onions, and thin slices of lemongrass. With all the textures and the flavors coming together, it is a soothing and refreshing dish that’s perfect for a hot day. While it sounds like an exceedingly basic offering, Galam Blee Pad Kai Sai Moo Saap, a dish of fried cabbage with minced pork meat and eggs, don’t let that fool you. It is cooked over a big flame using oil that is scalding hot. By doing this, the cabbage stays crispy and the bits of pork and scrambled eggs give more variety to the texture. 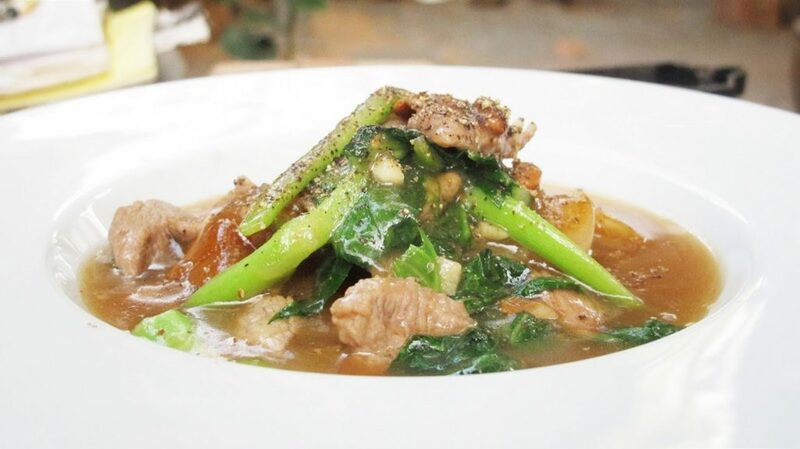 It looks very ordinary but one taste and you’ll see why Thai people love this home-style comforting dish. Looking for a cheap yet satisfying meal in Thailand? 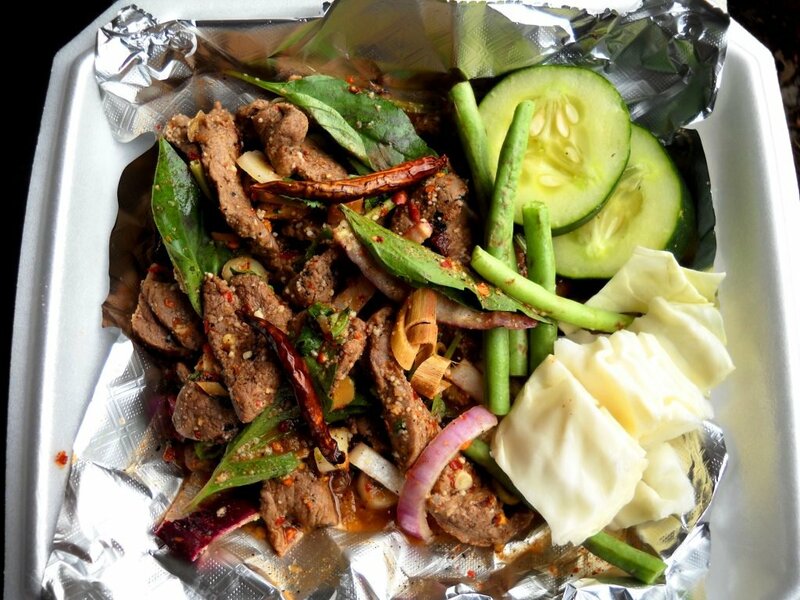 Gai Pad Prik Gaeng (Chicken Fried with Chili Paste) is one of the tastiest deal you can get. For roughly the equivalent of a dollar, you’ll get a heaping plate of vegetables and chicken that are fried along with spicy red chili paste and fresh basil. For anyone who loves spicy food that makes your mouth burn in the most wonderful of ways, you’ll want to tuck into this. 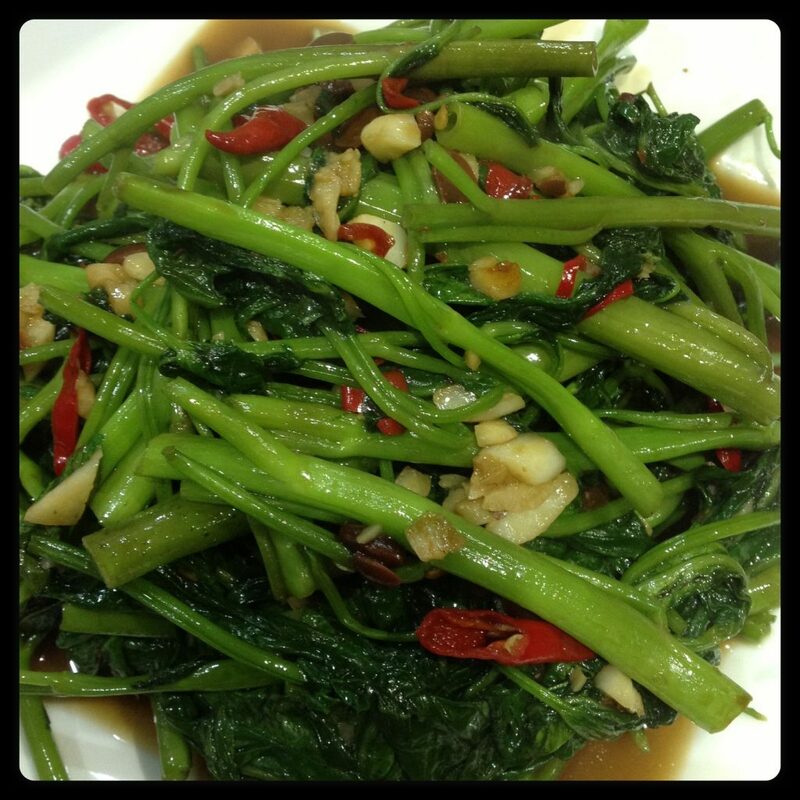 Morning glory, known as water spinach, is a commonplace vegetable in Thailand. If you like spinach, you’ll enjoy it. Pad Pak Bung Fai Daeng is a vegetable dish that uses high heat to scorch the morning glory just enough that it still retains a fresh and crispy taste. It’s flavored with oyster sauce, making it a salty and savory side dish that works well with just about any other dish. Eggplant is such a versatile vegetable. Around the world, you can find it used in so many ways. 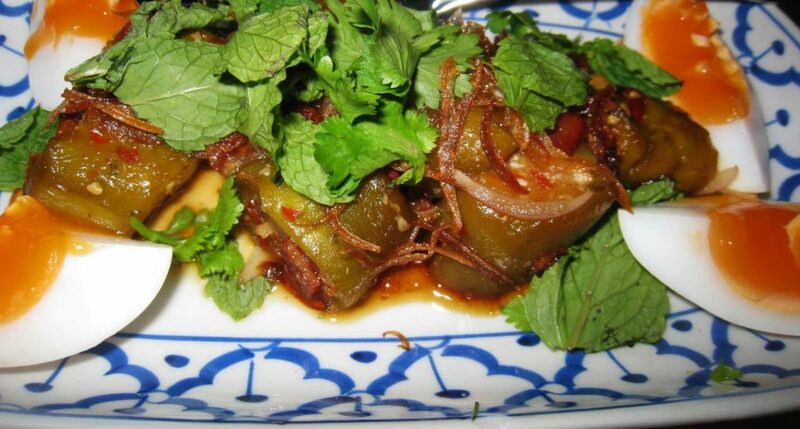 Throughout Asia, eggplant is widely used. Although it seems more like something you see on your local Chinese menu, Thailand also utilizes this vegetable, with spectacular results. Yam Makua Yao is a roasted eggplant salad. First, the eggplant is roasted to get that soft, almost mushy texture. Once it’s roasted just right, it’s added to a salad of red chilies and red onions and then drenched with fish sauce and lime juice, creating a dressing unlike any other. Thailand is full of spicy chili sauces and pastes. One of the most popular is Nam Prik. While each region has their own version of this sauce, Nam Prik Kaphi is the most widely used one. It is made with fermented shrimp sauce, pounded chilies, lime juice and a bit of Thai herbs and seasonings. 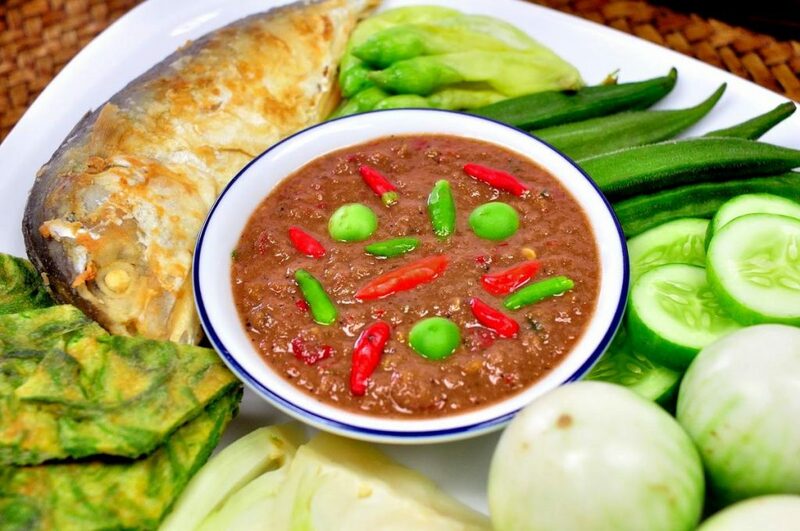 It sounds so simple, but adding this shrimp paste sauce to freshly steamed vegetables and enjoying it over sticky rise is one of the greatest culinary delights you’ll ever know. 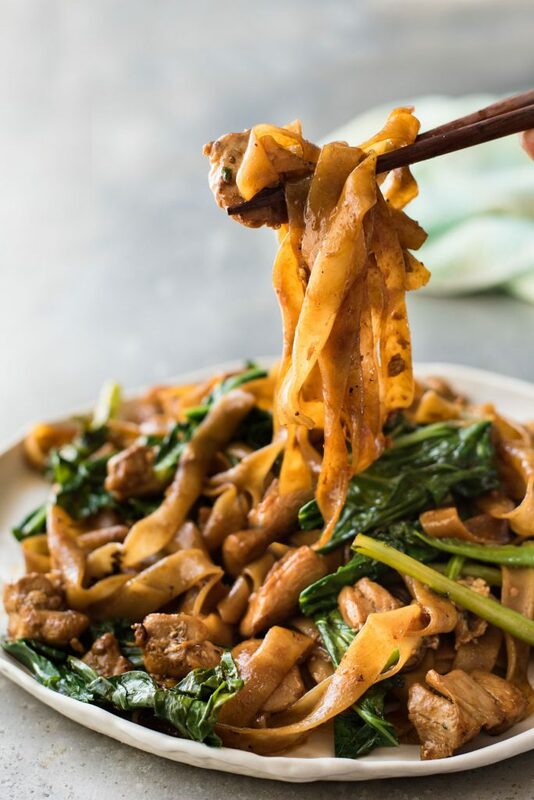 With a name like Drunken Noodles, it’s got to be good. Pad Kee Mao Sen Yai is a dish of wide rice noodles that are fried with meat (typically pork) and vegetables (like carrots, baby corn, and peas for example). It’s salty and a bit greasy but it is incredibly delicious. After a night of drinking around Bangkok, a bowl of Pad Kee Mao Sen Yai will definitely satisfy your soul. Don’t confuse this dish of wide rice noodles with Pad Kee Mao Sen Yai. 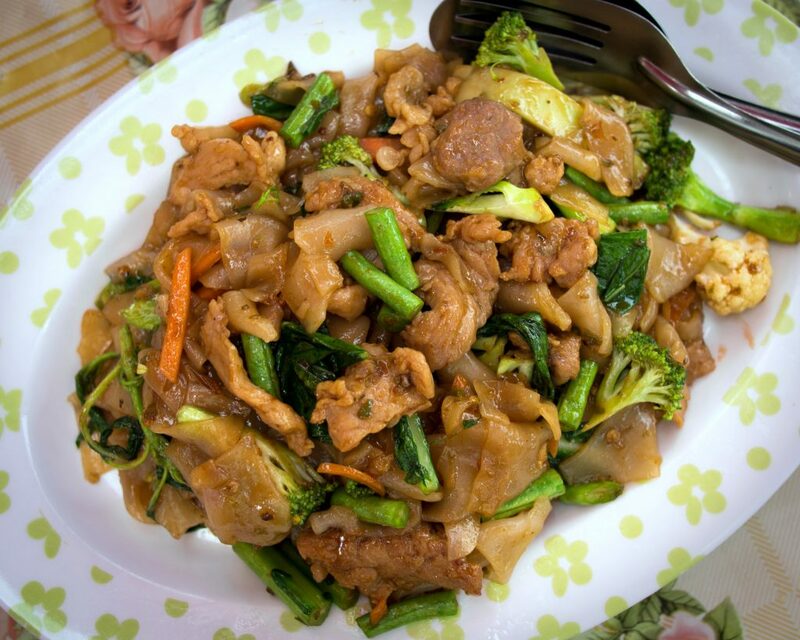 While both are made with those big, fat noodles, Pad See Ew generally only includes pork along with a little cabbage. It’s darker too, thanks to the use of dark soy sauce. To fully enjoy this dish, spoon on chili flakes and drizzle in some vinegar to make the flavors come together in a most dramatic way. 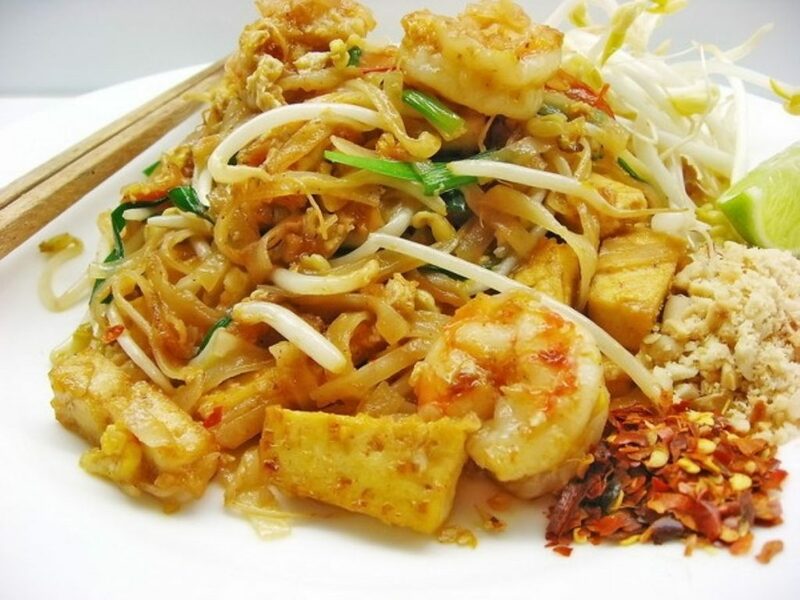 Of all the dishes of Thailand, Pad Thai is probably the most famous in the world. It’s sweet, salty, crunchy, and nutty and unbelievably delicious. If you’ve come to Thailand and you’ve never before tried Pad Thai, you must cross it off your Thai food bucket list. Stir-fried noodles meet with eggs, chopped firm tofu, bean sprouts, coriander leaves, garlic chives, shrimp, red chilies, palm sugar, and fish sauce. It’s garnished with a lime wedge so you can give it a nice hefty squeeze. That bit of citrus element is what brings the whole symphony of flavors together. It’s everywhere, from push-cart vendors on the side of the street to high-end eateries. 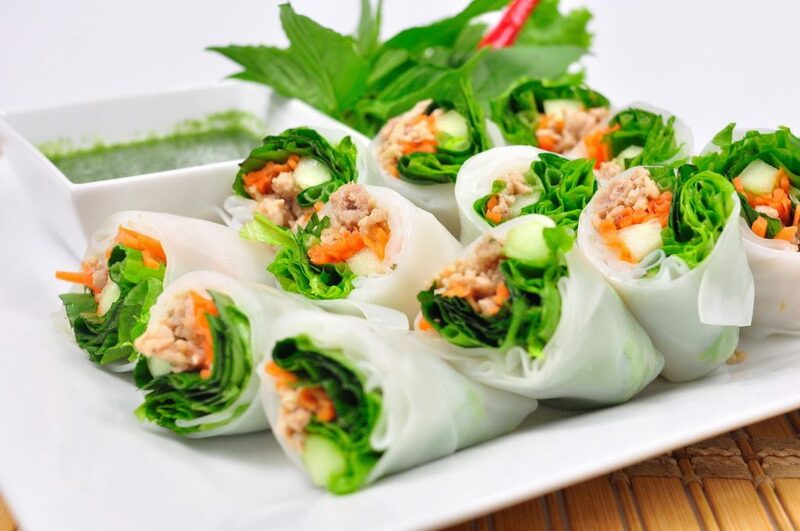 In Thai restaurants in America, you’ve likely seen spring rolls. However, Kuay Teow Lui Suan is a version of spring rolls that use wide rice noodles for the wrappers instead of rice paper. 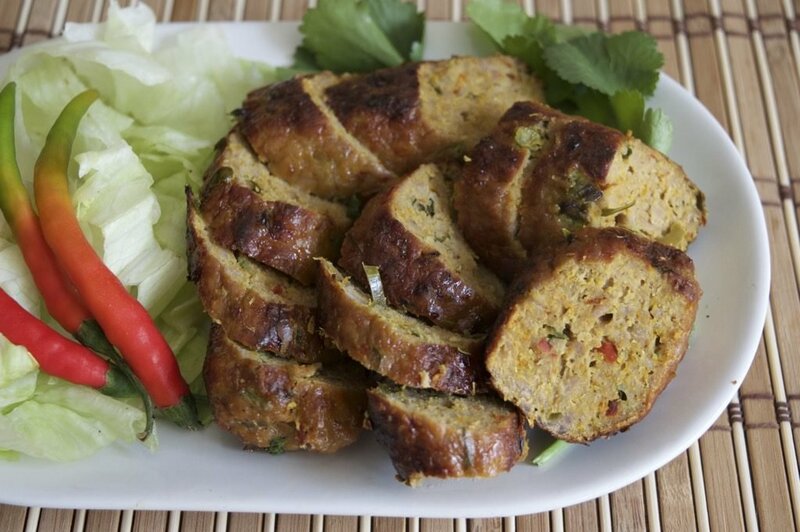 These wide flat rice noodles are stuffed with lettuce and herbs plus sausage or shrimp. It comes with a green sweet chili dipping sauce. You can also get them with tofu to keep them completely vegetarian. A popular dish for the locals is Yam Woon Sen. Honestly, you can’t go wrong ordering what the locals order in Thailand. This salad made of mungbean noodles often contains the most random ingredients like bits of various seafood, minced pork, tomatoes, celery, and onions. It also includes imitation crab and very possibly will contain Thai hot dogs. Lime juice and sugar unite to create the zesty dressing that makes this salad unforgettable. 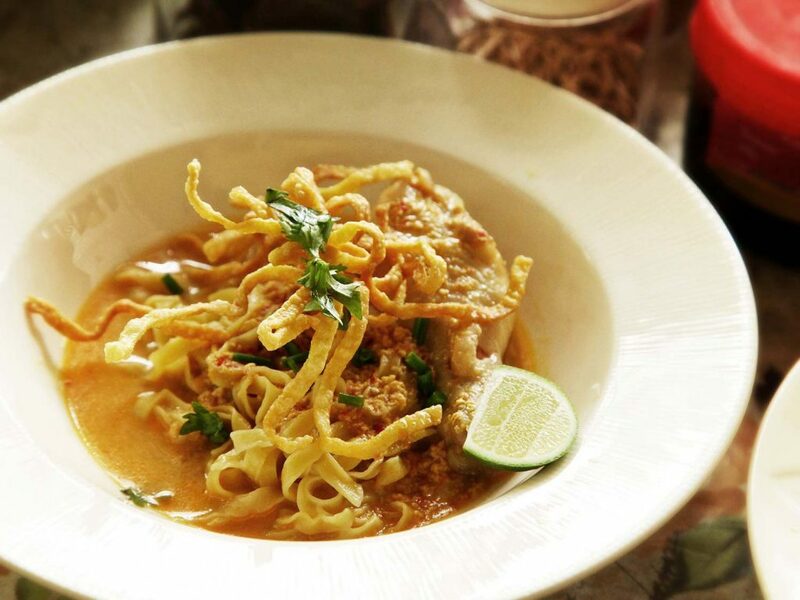 Northern Thailand is responsible for Khao Soi, a dish of flat egg noodles in a creamy coconut curry sauce. Indulging the flavors from Burma, it is infused with masala which gives it a completely unique spin. You’ll usually find this dish made with chicken or beef. You’ll know you’ve got a good version of it when it comes with pickled mustard greens, red onions, and a wedge of lime to squeeze on top. Some places will serve it with pork though in this dish, it’s much less common. 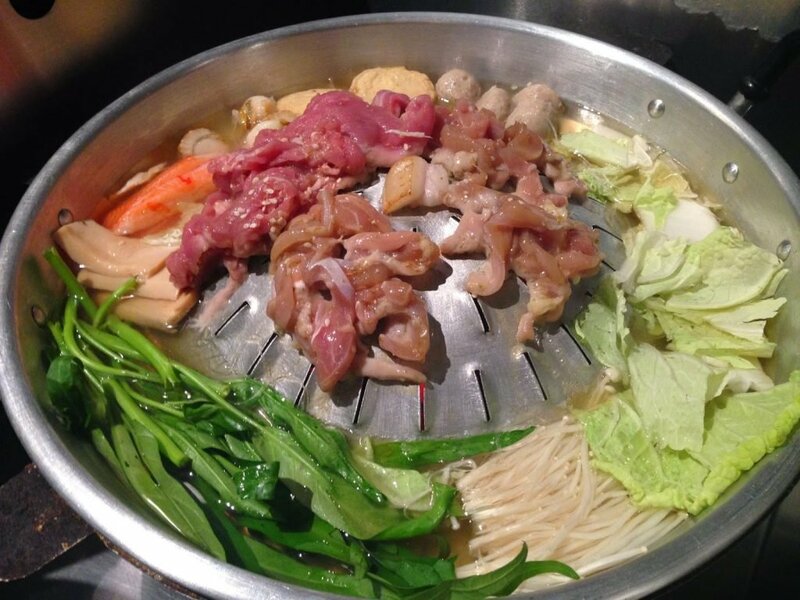 Sukiyaki, or Suki as it’s known in Thailand comes in two very different varieties. The first one is more or less a Thai-style hot pot called Suki Nam. It’s a boiling pot of soup that you cook your meats, vegetables and noodles in all on your own table. The other type of Suki is Suki Haeng. It’s the same vegetables, meats and noodles you get with the Suki Nam, only they are stir fried instead of being boiled. Which one is tastier? It’s all a matter of preference. Suki Nam is a more healthful choice because it isn’t fried, but sometimes fried food is exactly what you need to satisfy your hunger. Do you like mashed potatoes with gravy? You know that brown gravy that your mom would likely ladle all over your plate of turkey, mashed potatoes and stuffing during holiday feasts? Imagine that gravy on top of noodles. That’s Radna for you. It’s a brown gravy made from pork. It’s thick and often comes with vinegar and chili flakes on the side so you can add a little extra something to it. Don’t do more than a scoop of vinegar though or you’ll overdo it. A spoonful of chili flakes should be plenty too. Radna comes in two styles. Sen Yai Radna is made with wide rice noodles while Sen Mee Radna is made with angel hair-style noodles. The wider noodles seem to go better with the Radna, but you can decide for yourself. Either way, the Radna is the definite star of this dish. 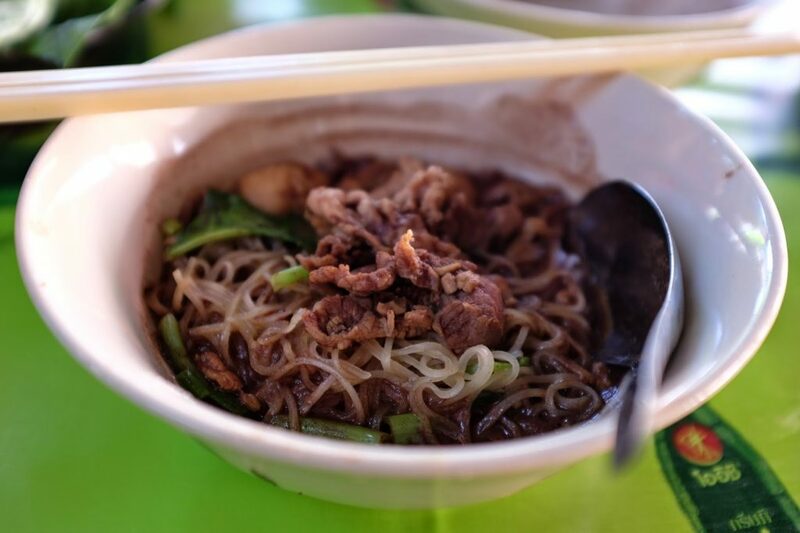 Kuay Teow Reua, or Thai Boat Noodles, aren’t shaped like boats but rather, are named as such because they once were served by vendors from the boats. When you ask a Thai person what you should eat, one of the things they will tell you that you need to try is this dish. The people of Thailand are very enamored with this dish and it’s easy to see why. The broth is what makes this hot soup and noodle dish such a treat. Don’t let the secret ingredient scare you off either. Just a bit of pig’s blood is what lends it an unforgettable rich, pork flavor. Once you try it, you will know why everyone in Thailand is so passionate about it. 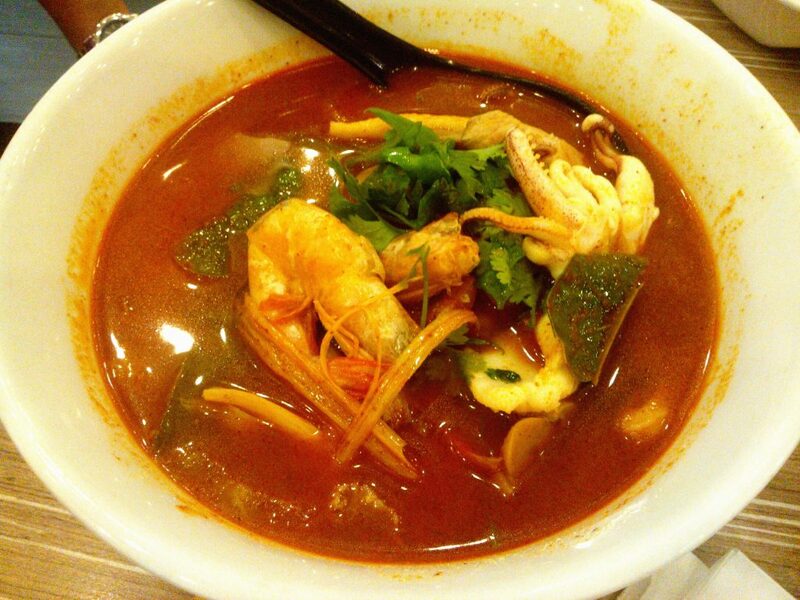 Add Kuay Teow Tom Yum to your list of must-try noodle dishes in Thailand. While it is one of the more common choices, you’ll be sorry if you miss out. This side dish is available everywhere you look from the street corners to the sit down restaurants. It’s a sweet and sour soup filled with meat. It’s very simple and left plain on purpose. On the side, you have vinegar, chili flakes, and roasted ground peanuts that you can (and should!) add until you have the perfect balance for your palate. Some people like it spicier and add more flakes. Some people like a little more sour so they add more vinegar. And some people just love peanuts and pile them on top. Some Thai people will tell you to add a little sugar on top. This gives it a sweet taste instead of a more savory one. Gaeng Som, or Sour Soup, comes in a multitude of varieties in Thailand. Trying them all is part of the fun. There’s a bit of variance to each and trying to decide on your favorite can be tough. Best to just like them all. When you order Gaeng Som in Bangkok for example, you’ll find it’s a bit reddish and includes shrimp. Head south though and you’ll find the Gaeng Som there bursting with chilies and turmeric. Wherever you try it, be prepared for a spicy blast of broth! 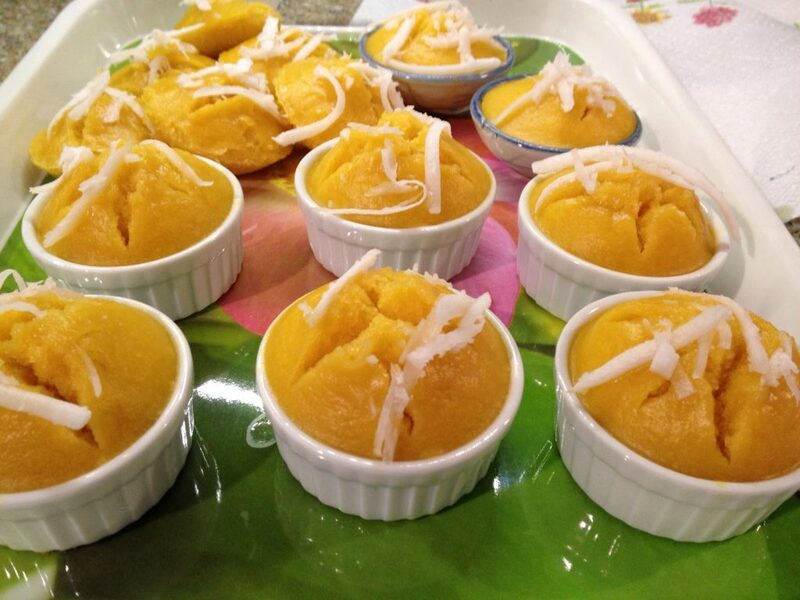 With all this spicy, citrusy flavor, you’ll be happy to know that Thailand is home to some fantastic desserts. They’re wonderful after a big meal or simply for a snack. One such item is Khanom Gluav, or Banana Treat. It’s green in appearance thanks to soaking Pandanus leaves in cold water. This is then added to a mixture of sticky rice, bananas, sugar, and shredded coconut. The result is a fruity concoction of epic proportions. Want something really rich? Try Khao Neow Sang Kaya. 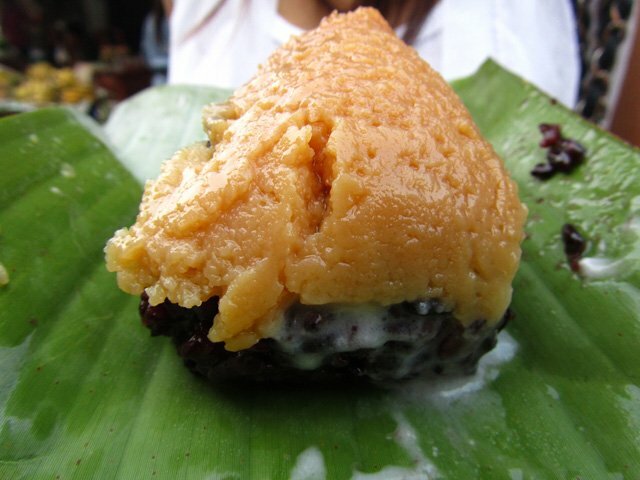 It’s a dessert of sticky rice with a thick slice of firm, sweet and creamy custard on top. Decadent and divine, it is a dessert that any sweet tooth will devour. Another super-sweet dessert treat is Tong Yord. 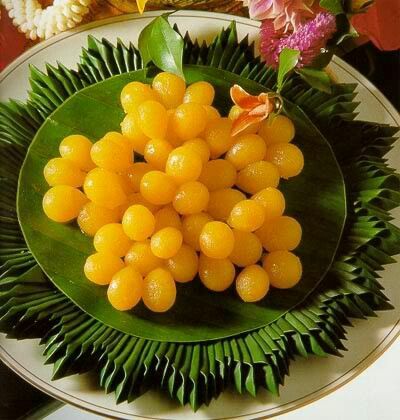 This round egg yolk tart is made from egg yolks, sugar, and flower water that are boiled up in sugar syrup. Once done, they rolled into balls. It’s sugary and sweet, just what you need after a savory meal. 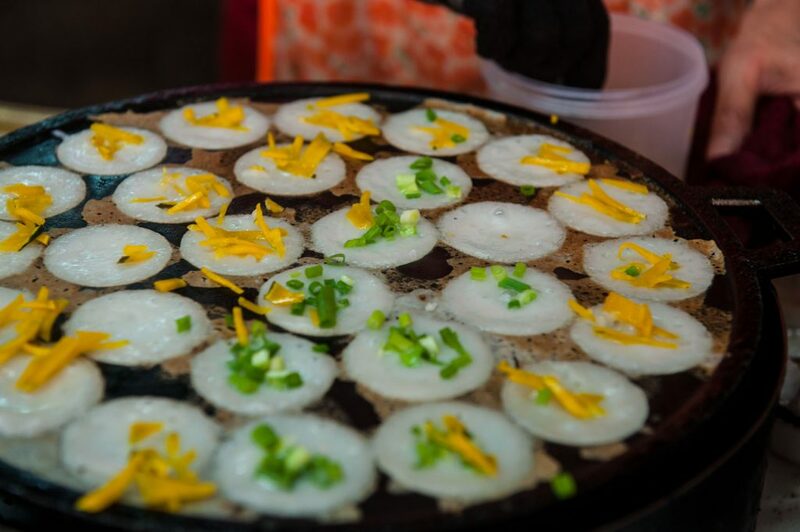 Melt in your mouth deliciousness comes in the form of Khanom Krok, coconut rice dumplings. 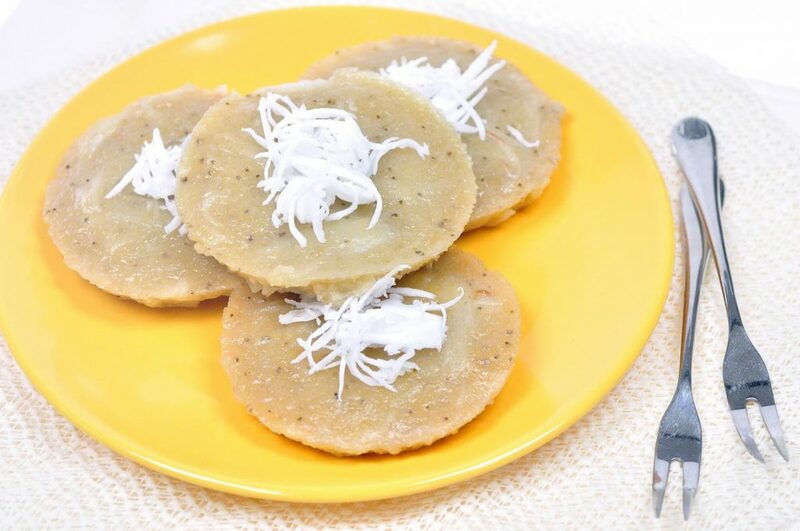 These are a traditional Thai dessert made from coconut and rice flour dumplings. After they’re cooked, you can choose to top them with taro, sweet corn, green onions, or enjoy them as-is. Eating them hot is the best way to enjoy them. 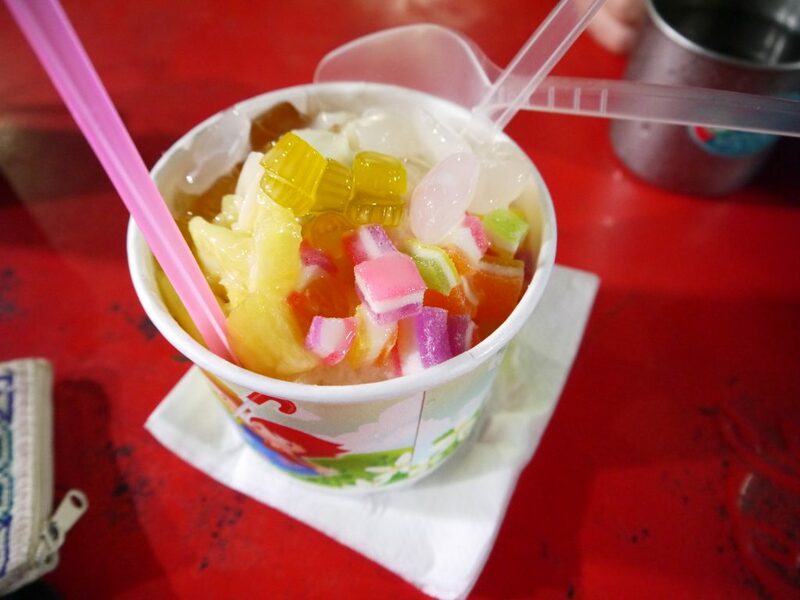 Thailand has its own Jello dessert. It’s made by setting sugar, coconut milk, and flour to harden into a pan. 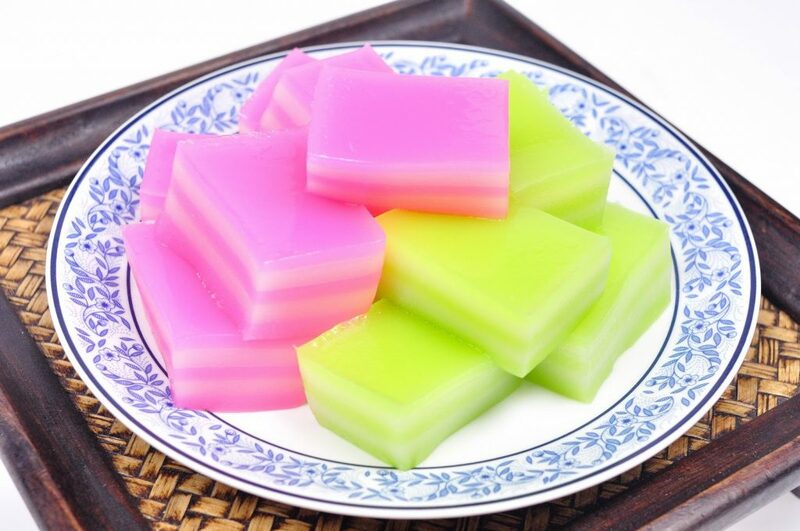 The result is a sweet coconut-flavored jelly that is one of the most popular of the Thai desserts. This icy treat is ideal to enjoy on a scorching hot day. It really hits the spot. You can choose from a variety of jellies and candied fruits. These get piled into a bowl and topped off with chunks of ice. It’s then doused with sweet syrup and coconut milk. Sometimes, it will get drenched with even more syrup. Nam Kang Sai is one dessert that never disappoints! To most American, these little cakes will taste a lot like corn bread. Khanom Tarn is made with palm heart. Steamed in palm branches, they are commonly served from the street carts. They make for a great sweet treat when you’re moving and grooving through the cities of Thailand. Thai cuisine really is some of the best in the world. Beyond these 50 delectable dishes, there are hundreds more that you can discover when you visit Thailand, the land of smiles. It’s easy to see why it’s earned such a nickname too. With so many delightful culinary creations, it seems impossible that anyone could frown. Do you have a favorite Thai dish? Let us know!